The Engraved Key Pendant Necklace with CZ Gemstone makes a wonderful gift for any special occasion or as a simple way to say "I love you." The key shaped pendant is fun and simple and is designed so that it hangs straight and is easily seen against any fabric. Each key pendant can be engraved with a name, up to ten characters in length. You can also further personalize the pendant by selecting a CZ birthstone to be added to the pendant too! Enjoy the luster and shine of fins sterling silver and the pop of color the birthstone provides. This Engraved Key Pendant and Birthstone Set makes a great gift and is the perfect addition to any outfit! 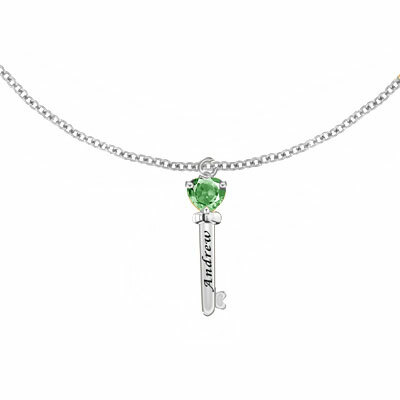 We guarantee our Engraved Key Pendant Necklace with CZ Gemstone in Sterling Silver to be high quality, authentic jewelry, as described above.